RELIGION: Why Are We Surprised When Buddhists Are Violent? 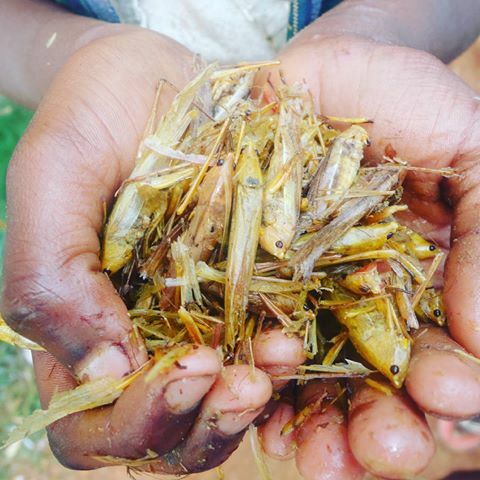 Grasshoppers, locally known as nsenene, are considered a delicacy and they are seasonally harvested in March, April, May and November. But many people, who collect or eat them, hardly know the origin, breeding and migration patterns. Traditionally, it was believed that nsenene fell from the skies. Ensenene zagudde (Luganda for “grasshoppers have fallen”) is a common phrase used to announce their appearance in an area. However, Mr Deo Kiwanuka, 65, picked interest in breeding and rearing them on a small scale. The retired industrial technician is a farmer in Njjangano Village in Buwunga Sub county, Masaka District. He refuted the myth asserting that grasshoppers breed like any other insects; they lay their eggs in semi-arid areas under the sands. In a bid to maintain sustainable production, Deo Kiwanuka has been working with the assistance of researchers from Makerere University since last year to breed grasshoppers. 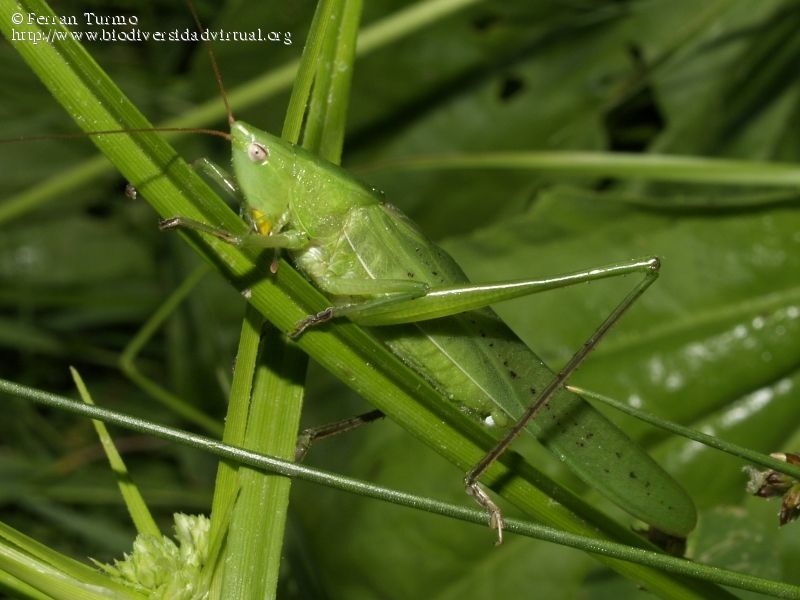 He collects mature grasshoppers and put them in sand soils near the swamps where he keeps monitoring them for a period of two months and when they lay eggs in clusters, he collects them and takes the eggs to laboratories at the university for hatching. He says, grasshoppers inhabit Central and West Africa and widespread in inter-tropical areas. They are blown by monsoon winds to other parts of continent like Uganda. Kiwanuka says, he got to know this when he visited Malawi where he found the swarm of grasshoppers where they had laid eggs. The climatic conditions in these dry areas favour the egg development until they begin to move in swarms at the adult stage. The colouring of different species is often dependent on the environment, with many adapted to fields and forests to avoid predators. Greater Masaka is generally known because of its lucrative trade in grasshoppers and it has become a valuable source of income for many people. In Nyendo town, people devised a method of collecting grasshoppers using large shiny iron sheets lined up vertically into a barrel at the bottom with bright bulbs suspended to attract them to the trap. When the grasshoppers come to the lights, they circle around them until they fall onto the sheets, and slide into the barrels. While in the trap, they cannot escape. This is the large-scale method that was popularised in Masaka District where grasshoppers swarm in very large numbers. The method has since caught on in urban areas like Kampala and in other districts. It is also being used in both rural and urban areas in central, southern and some parts of western Uganda. Kiwanuka says his idea will conserve the environment where people will not be cutting down the trees and destroying the sandy areas where the grasshoppers breed. In addition, it is a way to overcome the challenges associated with the “bright lights-iron sheets-drums” method. Some grasshopper trappers in Masaka have welcomed Kiwanuka’s innovative idea of breeding grasshoppers. They said sustainable production of grasshoppers will help in continued income generation and provision of a food source. It is a trend now to grow bugs for protein. Below are some links you might find useful. A female grasshopper lays eggs in small egg clusters, usually in the ground but she can also deposit them in plant material. Young grasshoppers are called nymphs and already look like miniature versions of the parents. Nymphs lack wings, only adult grasshoppers have fully functional wings. Grasshopper nymphs grow fast and shed their skin (molt) around 8 times in the process. At the last molt both males and females grow long wings that pass the abdomen. It takes around 2 – 3 weeks for eggs to hatch. In around 4 weeks the nymphs reach adulthood. Around two weeks after that they begin to mate and produce eggs. If the temperature is low, development and breeding will slow down too. A grasshopper will die of old age when it has been an adult for around 5 months. Housing grasshoppers is easy. You need a container that is big enough, has some ventilation and can be closed properly to prevent escape. 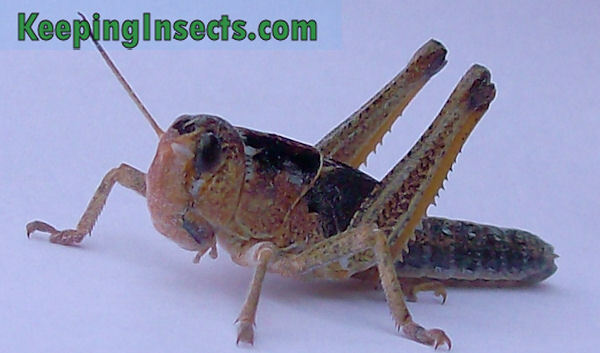 Grasshoppers can chew through fabric gauze, so net cages or cages with a fabric cover are not suitable for grasshoppers. A fauna box, a glass terrarium or a plastic terrarium with metal mesh for ventilation will do. If you keep the grasshoppers as pets, a glass terrarium with a mesh lid will look good. If you keep the grasshoppers to feed them to reptiles or praying mantises you a plastic container is more practical, as it is lightweight and cheaper. Make sure the container is big enough for all grasshoppers. Twelve adult grasshoppers need a cage of around 50 x 50 x 30 cm at least. Bigger is always better. Fill the bottom of the container with dry sand, dry oatmeal flakes or dry coconut fibers. Place some dry twigs or branches in the enclosure to provide extra surface for the grasshoppers to sit on. The food of the grasshoppers, grass and/or leaves, will also serve as decoration and perching areas. Make sure light reaches into the container, either by a light bulb (see next section about Temperature) or by natural light. Direct sunlight shining into the enclosure could heat it up too much, make sure to prevent overheating. The grasshopper species Locusta migratoria and Schistocerca gregaria are desert species. They need a dry and warm environment to thrive. 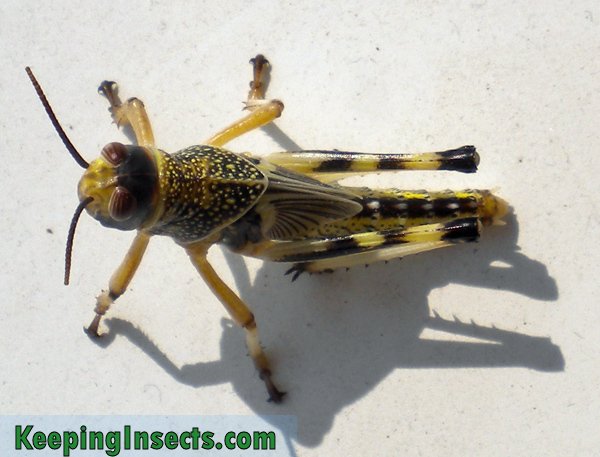 A too humid environment will result in infections and death of the grasshoppers. A too cold environment will slow down development and make breeding grasshoppers impossible. Keep the temperature during the day between 25 and 35 degrees Celsius. By night you can allow the temperature to drop to 15 degrees Celsius. The best way to heat the enclosure of grasshoppers is with a regular light bulb. It is also possible to heat the terrarium with a species heat bulb, found in reptile-specialized pet shops. You can heat the enclosure with a heat mat too. More information about heating any insect enclosure can be read at our page Temperature. Keep the humidity low by placing dry bedding in the enclosure (dry coconut fiber, oatmeal flakes or dry sand) and not spraying with water. 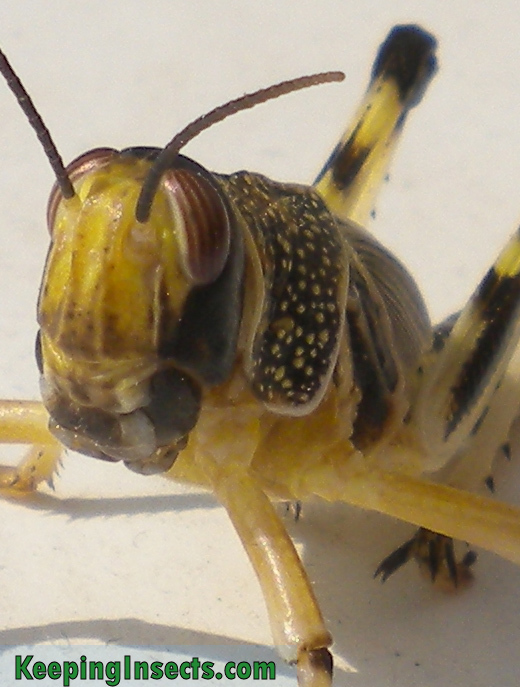 Grasshoppers do need moisture to survive, but can get this from their food. Lightly spray fresh food with water before feeding it to your grasshoppers. If you feel like the enclosure is getting moist, for example when you have an enclosure with little ventilation or if the enclosure is placed in a room with high air humidity, then you can better skip the spraying of the food. 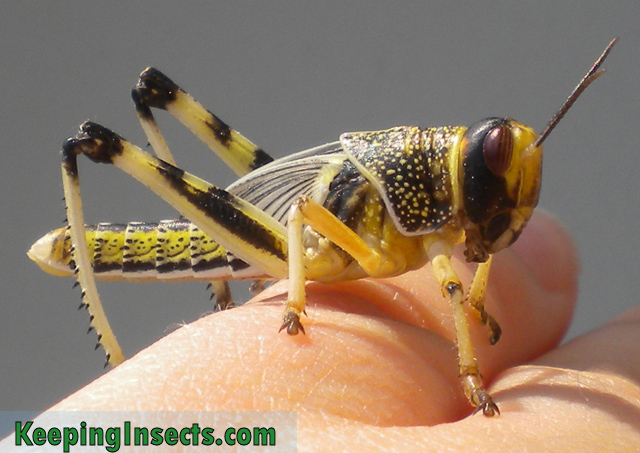 The locusts will get all their moisture from the fresh plant material that you give them. Locusta migratoria and Schistocerca gregaria eat only plant material. The best food and easiest food you can give them is fresh grass. Even better is fresh reed, reedgrass or canary grass (Phalaris arundinacea) if available. Fresh wheat leaves, corn leaves and other vegetable plants may also be eaten. But actually, many plant species will be eaten by grasshoppers. You can try to feed them any kind of grass-like species; if they eat the plants, it means that this is a suitable plant species. Generally grasshoppers will refuse to eat any poisonous plants. Be very aware of insecticide, if any plant has been spraying with insecticide it will be deadly to your grasshoppers. Place the food plants inside the enclosure of the grasshoppers. They will start to eat from it instantly. At some point the plant will be too dry to eat, then the grasshoppers should be fed again with fresh plants. Once in a while you should clear out all old dry plant material from the enclosure.